View from the top of the Baphuon Temple in the temple city of Angkor Thom; this central axis and water ponds (actually moats - the Khmer rulers were hugely fond of them) can compete with Versailles itself, don't you think? The Baphuon Temple lies within the temple city of Angkor Thom, just northwest from the temple in my previous post, the Bayon... and these are just two of the countless (well, at it least felt so) marvellous temples in this area, which in its turn is only one of temple areas of the ancient Khmer empire. Which makes me wonder what else did they could have had time and resources to do than to build temples? The Baphuon is the state temple of King Udayadityavarman II, built in the mid-11th century. It is a three tiered temple mountain dedicated to the Hindu God Shiva (some sources say Lingam, so I'm not quite sure, but I go with the guide book I bought in Siem Reap...). 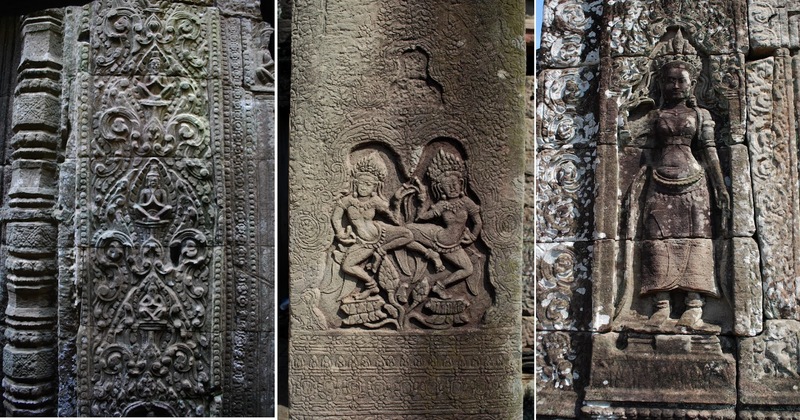 I know I'm overusing the word, but amazing is what I thought, and will always do of the creations of the Khmer civilization. View from the central walkway to the entrance on the east side of the temple - temples in Angkor open to the east, as the Khmer thought is was the direction of life and new beginnings; according to our guide, many people in Cambodia still sleep with their faces to the east. West is considered the direction of closure and death. The moat is almost overgrown, but used to be fully rectangular; sometimes, crocodiles were kept in the moats. Windows opening from the central, smaller entrance that can be seen in the middle of the first picture. No, you are not alone anywhere at the Angkor archaeological sites anymore - the place is filled with mostly middle-aged, culturally interested tourists properly clad in sunhats and sensible shoes... but who cares, this place is such a wonder to see. (the two young and pink exceptions above are my daughters, the only kids we saw there during our four day visit). Entrance to the inner temple, through a series of stone corridors. The north side of the temple forms a reclining Buddha, which was difficult but possible to see at place, but unfortunately impossible to understand in the photo. The jungle keeps trying to reclaim the temple... and occasionally almost succeeds, as seen in the last photo below. The tree roots are like huge, organic trunks that ruthlessly push their way through the stonework. The Master-of-Nets Garden (Wǎngshī Yuán) at 7:30 in the morning. The sun is rising above the high walls of the garden. Originally from the Southern Song Dynasty in the 1100s, is has been rebuilt several times through the centuries. Its original name was the Hermit Fisherman Garden, which refers to the owner's retreat from the social life into the natural world. Built as an abode for an aristocratic family, this small but elegant garden complex is considered one of the most exquisite of its size and type. 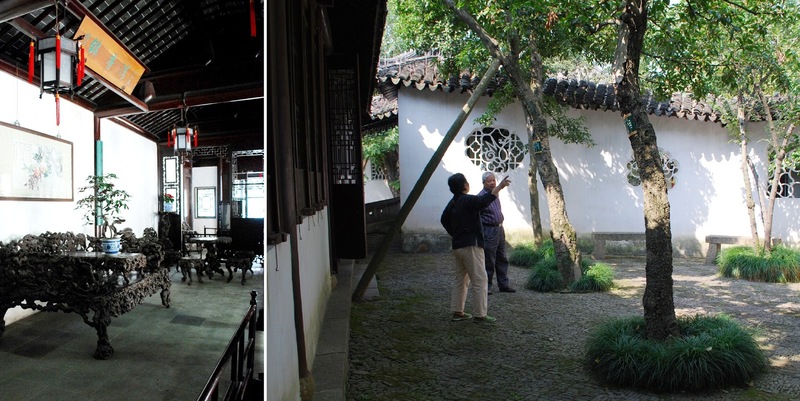 The gardens of Suzhou have centuries of history behind them and there is no way of compressing it into blog-sized posts... So I just thought of walking you through the gardens, with small notes on each picture. 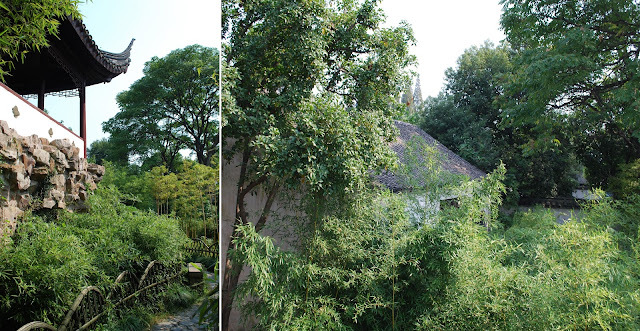 I didn't expect to be affected by the gardens of Suzhou as much as I did; their restrained, highly disciplined sophistication definitely struck an unforeseen chord inside me. To be so tightly, intellectually composed - every single stone, plant, window and piece of woodwork has its meaning and place in the garden - and still radiating such serene tranquility and harmony is a lesson in garden making that I won't be forgetting soon. A paving depicting a crane and a branch of pine in a little courtyard leading to Tiyun Room (Room of Cloud Ladder) seen below. The crane and the pine each symbolize long life. They also symbolize conjugal fidelity: the crane mates for life, and pine needles fall from the tree in pairs. You can reach a study on the second floor by climbing up the rockery under it. The name of the house refers to a poem verse of "climbing up the ladder of cloud to reach the moon". To understand these gardens, it is important to study the philosophy behind them deriving from ancient Chinese culture - the principles taught in I Ching and by Taoism and Confucianism, and their related expressions in painting and poetry. I've been spending time trying to grasp this universe of teachings, but of course, my learning is still very limited. What I would love to mention is that these gardens were not constructed to copy the beauty of nature as it is, but to master the forms and to explore the Tao embedded in them. As Hu Jie mentions in his excellent book The Splendid Chinese Garden - Origins, Aesthetics and Architecture, the Chinese believe that all visible phenomena in nature represent the principle of Tao, and can thus become objects of art and have artistic value. So the "nature" in Chinese gardens is not simply a copied miniature of real mountains and waters, but a world that has experienced human construction, generalizing, processing and refining, and thus represents the supreme spiritual realm of the natural world as a "condensed mini-universe in human embrace", as Hu Jie puts it. And so they felt, complete in their own beauty and serenity, offering new delightful views and sights behind every unfolding nook and corner. Climbing in an out of the rockeries resembling mountains. Confucius wrote that "the wise likes water, while the benevolent likes mountains"; in Chinese garden art the mountain is considered as benevolent, silent and everlasting, and thus an inspiration for human thought. "The Watching Pines and Appreciating Paintings Studio" - watching evergreen pines in the winter had metaphorical associations, and "appreciating paintings" referred to being able to read and gain understading of paintings as pictorial records of philosophic thoughts and concepts. In and out from the studio; a view through latticed doors and a moongate all the way to the Rose Cloud Pool that forms the center of the garden. First rays of sun climbing over the high walls to an enclosed courtyard by the Wu Feng Study, with a carefully orchestrated scenery of rocks, grasses, osmanthus and tree peonies. A great example of how in Chinese garden art, even the smallest of spaces can feel indefinite, as they a built like condenced miniature worlds and sceneries. Beautiful woodwork and latticed windows; I love the way the columns stand on a rounded stone. 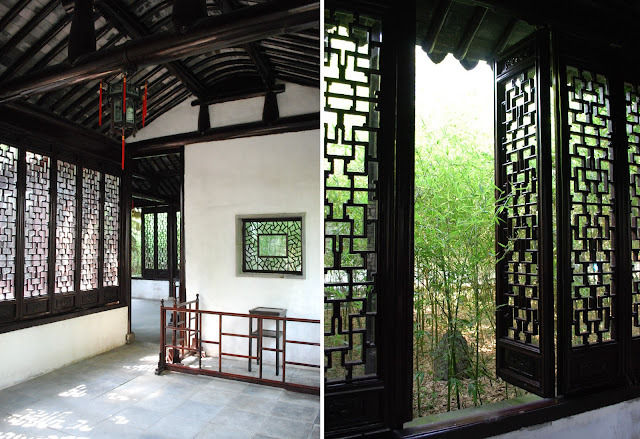 Inside the Dianchun Yi Study; borrowed views through windows are a key element in Chinese garden design. A covered pathway leading to Gallery of Osmathus Clusters on Hill - the roofs provide shade in summer and protect from rain in winter. Sheya corridor and the central pond called the Rosy Cloud Pool; the corridor was named after a duck shooting game that was popular among the maidens serving in the royal palaces in the ancient times. The Moon Comes with Breeze pavilion with a lantern on the right. The Pavilion for Washing Cap-Ribbon on the left, and the The Moon Comes with Breeze pavilion with a lantern again on the right. Walking around the central pond that feel much larger than its size (it is only about 330 sqm); and yet another view of the The Moon Comes with Breeze pavilion. Several carved windows both connect and separate the different courtyards of the garden, and always provide carefully thought-of views for the garden wanderer. Elaborate stones from Lake Taihu by the Pavilion of Cold Spring; these stones were especially appreciated for their imaginative forms and in the end became so popular that craftsmen started chiseling copies of them by hand. Carved windows extend the garden beyond the walls. A champion bridge. I leave you with a picture of a small stone bridge in the southeastern part of the pond that I photographed quite accidentally. Only afterwards I noticed it in Hu Jie's book, with a note that "it is so exquisite that it is ranked as a champion among all smallscaled bridges in all the gardens of Suzhou". Honestly, I would never have guessed. There is so much to know and to understand, and it would take years to really learn to appreciate these gardens as the true connoisseurs do. But even with my limited knowledge, I do enjoy their quiet elegance and charm.